Telkom Kenya has had some of the best cellular rates for a while now in comparison to Safaricom, they boast some of the best data, voice and text bundles in the country and at some point, I jumped on the bandwagon, not completely but it’s good to have a cheaper alternative that comes in handy. Besides what I’ve seen on their aggressive adverts, I’ve learned a lot on the provider’s services, I was for example really impressed just how easy it was to purchase airtime directly from MPESA – and it’s instant. If you’ve used MPESA’s LIPA NA MPESA service to pay for bills such as electricity, pay TV or internet, the process is exactly the same. All you need to replace is the Paybill number and account number and all will be a breeze. 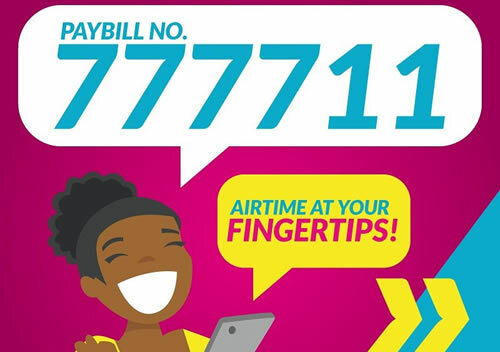 Telkom Kenya’s official MPESA PAYBILL NO for airtime top up through Safaricom’s MPESA is 777711, and the account number should be your Telkom number. First of course you need to have sufficient balance on your MPESA account, or utilize the fuliza mpesa overdraft facility in case you’re within your maximum limit. I’ve purchased twice for Ksh.50 and only charged Ksh.1 as transaction fee by MPESA. You’ll receive a confirmation text message of the transaction from MPESA as well as on your Telkom mobile phone. Now check your airtime balance by Dialing *144# it should reflect as the process is instant.